More than 100 design rules of thumb are listed in the above spreadsheet, together with attribution, scope, and trumping information. Noah Falstein and I are always looking for more rules, so please check the list for gaps (there are plenty), and send us your own contributions. This is the latest report from The 400 Project. When it began, I speculated that there might be as many as 400 informal rules for game design, most of them unexpressed. Noah & I (mostly Noah) have now accumulated more than 100 of these things, and it looks like there might be 4000 more lurking out there. Some of them govern huge tracts of design territory, some only apply to tiny domains. They clash and contradict each other. And yet, like the many rules developed to guide creative souls in other fields, they all contain germs of wisdom. 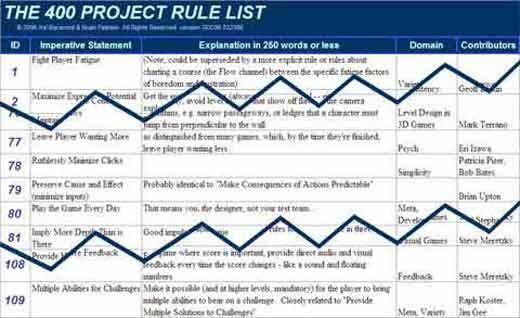 In 2001 at GDC I proposed the idea that game design can make good use of informal rules of thumb and discussed a few to illustrate. Now Noah Falstein has joined the search by launching The 400 Project, and we're back with some new rules to perplex and enlighten. Game design is an uncertain and murky endeavor. In this it resembles art, architecture, writing, moviemaking, engineering, medicine, and the law. All of these fields do their best to reason through their problems, but all have found it necessary to develop practical rules of thumb as well. Hmm — could game developers benefit from a similar approach? This talk has no doubts and takes the position that lots of rules are already out there, waiting to be discovered. How many might there be? Maybe 400 or so, of which vast total I discuss only four.